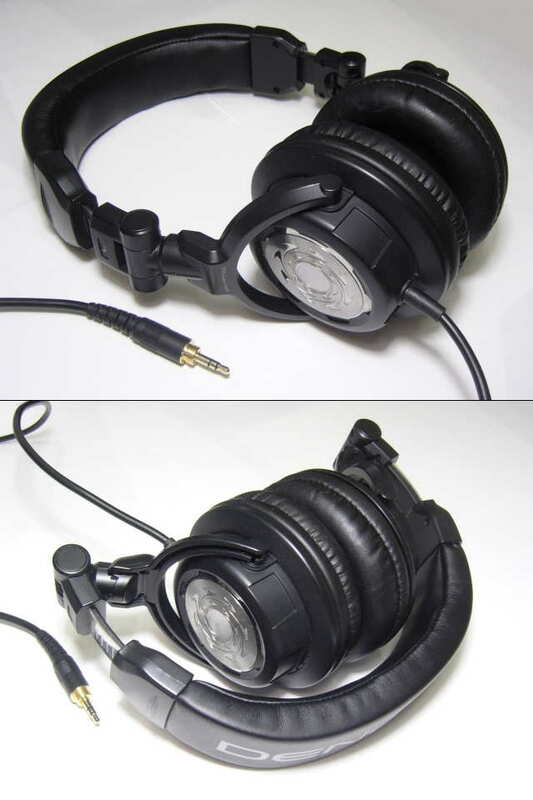 Build Quality (8.5/10): Built like a typical DJ headphone, the HP700 is made mostly out of hard and heavy plastic with the exception of the grilels, which are metal inserts, and the inner headband. Like most DJ headphones in its price range, the HP700 is both flat-folding and collapsible and comes with a long and thick coiled cord. The construction feels solid and should be nearly bulletproof in consumer applications. Comfort (8/10): The Denons clamp very lightly but stay on securely due to their weight and circumaural fit. Headband padding is quite soft but compresses easily and doesn’t provide the long-term comfort of the similarly-priced ATH-M50. The earcup pads on the HP700 also feel a bit flat compared to those of the M50, bottoming out on my ears. Fortunately the low clamping force prevents the mediocre padding from becoming an issue and also stops the HP700 from becoming as sweaty following lengthy listening sessions as the ATH-M50 or Ultrasone HFI-450. Isolation (7/10): Isolation is decent but not great for a large circumaural DJ headphone due to the stiff pads and low clamping force. They will tone down some outside noise but I wouldn’t use them on a plane. Leakage is extremely minimal. Sound (8.5/10): While the build, comfort, and isolation of the HP700 are competent, they don’t give it a leg up on most of the competition – nearly all DJ phones are well-built, reasonably comfortable, and have a tendency to isolate. Sound is another matter however – of all the half-dozen $100 studio and DJ cans I’ve tried, the Denons stand alongside the ATH-M50 as the best of the best, but only when run through a proper amplifier. With my mini3, the HP700 encroached on the ATH-M50 in overall performance. With my Tianyun Zero, the Denons are at least as good as the Audio-Technicas, which came as a huge surprise since I’ve never seen a single mention of them around head-fi while the ATH-M50 pops up in every other thread. But enough rambling – on to the sound. One of the hallmarks of the DN-HP700 is the excellent presence across the entire frequency range. The low end drops down below 30Hz without losing ground and is still audible below 25Hz. Impact is plentiful for me but slightly less immediate than that of the ATH-M50. Overall bass quantity is only a bit less than with the ATH-M50 and HD25-1 when the Denons are fed enough power. The slight drop in bass power compared to the HD25 actually allows the Denons to be tighter and more controlled, which is very impressive. The low end is well-textured and full-bodied in nature. It is quick, carries a good amount of energy, and always sounds natural. Among all of my DJ-style headphones, the bass of the DN-HP700 aligns best with my preferences – for a mid-range DJ can it really is very polite but still not lacking in emphasis. The midrange is smooth and sweet and remains in balance with the bass and treble when the HP700 is supplied with sufficient power. From a weak portable player like my Sansa Clip, the mids are slightly recessed. Clarity and detail are very impressive and there is no bass bloat to obscure the midrange. The note of the HP700 lacks the crispness and sharpness of the HD25, which may be a positive for those who find the Sennheisers a bit too edgy, but the difference isn’t great. Compared to the Ultrasone HFI-450 and PRO 650, the Denons are still extremely well-defined and articulated, almost hyper-detailed – definitely closer to the HD25-1 than anything else I own. Like the Sennheisers, the Denons exhibit some peakiness in the upper midrange and treble and can be extremely unforgiving of recordings with poor mastering. The treble-sensitive would be well-advised to steer clear of the HP700. The treble carries plenty of sparkle and has good clarity and air. Extension is excellent and the HP700 has no trouble at the limits of my hearing, same as the HD25-1. The overall tone of the Denons is on the cooler side of neutral – they are one of the only sets I’ve heard that makes the HD25 sound slightly warm. Microdetail lags slightly behind the HD25 but the presentation easily makes for that – the soundstage of the HP700 doesn’t shine in depth but has good width, making the HD25-1 sound compressed. The HP700 also separates quite well which, combined with a good sense of space, allows it to handle complex passages better than the HD25 and at least on-par with the ATH-M50. Still, the HP700 is an aggressive headphone and does tend to favor an in-your-face presentation despite having the technical capacity for so much more. Using the popular room analogy, the HD25 is akin to sitting in a hermetically sealed two-car garage right in front of the band, the DN-HP700 is like sitting only a foot farther from the band but in a moderately large auditorium. Switching to the Ultrasone PRO 650, on the other hand, makes me feel like I just stood up and moved to the back row. It isn’t surprising, then, that I find the Ultrasones easily the most relaxing of the bunch – the bright and detailed nature of the Denons makes them rather demanding on the listener, not unlike my beloved ATH-CK10 IEMs. For those who like that sort of presentation, listening to the DN-HP700 can be an incredibly rewarding experience. For everyone else, the Denons could be a mixed bag. Value (8.5/10): Unlike the lower-end DN-HP500, the Denon DN-HP700 faces some very fierce competition in its size and price class, namely from the venerable Audio-Technica ATH-M50. The M50 is slightly more comfortable and a bit more isolating than the HP700. It also possesses a more ‘popular’ sound signature – the M50 is heavier on the bass and lighter on the treble than the Denons tend to be. The HP700 loses additional points (since this is a portable headphone shootout, after all) for being slightly harder to drive. Operational issues aside, I still feel that the sound of the HP700 is more than worth the price of admission. Considering the amount of praise the ATH-M50 gets around here, the Denons are clearly vastly underrated and those who find the ATH-M50 too bass-heavy or v-shaped for their liking should seriously consider the Denons as an alternative.